Right from the show’s opening – and until the curtain comes down – SIAL Paris 2016 offers the world’s most inspiring food sector show. Finding ideas, partners or customers … the whole range of possibilities is within your reach! 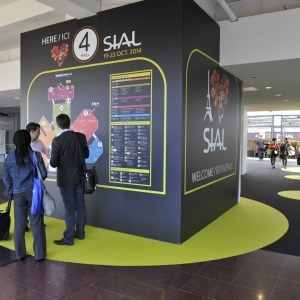 SIAL Paris, the place where the Food planet never sleeps! The new event at SIAL Paris dedicated to the Drinks sector, in collaboration with Victor Delpierre, World Champion Barista and Cocktails 2013. On the programme: lots of events centred on the hot and cold drinks world enable you to enjoy a cocktail of innovations, in the company of barmen and chefs. Inspire Drink is also the ideal event to get your own products tested. The catering professionals’ event! Demonstration sessions for inspiration from the world’s kitchens, an opportunity to meet with chefs and taste a Michelin-starred dish, a take-away area to discover new catering concepts, as well as the Espoirs de la Gastronomie competition! All under the patronage of Joël Robuchon! There’s a full programme … trend and news conferences to inspire and one-to-one meeting areas based around four main themes to increase the number of contacts and partnership opportunities! Registration is free, but obligatory if you want to take part! The event dedicated to the drinks sector and delicatessen The idea: to have your products tasted face to face with your core target, combining dishes with unexpected drinks. The food test is a fun and friendly way to find out about new tastes. Discussions and information on the major food industry challenges are all on SIAL TV. In a new hybrid and hyper-connected space, SIAL TV gives you the opportunity of attending and taking part in conferences, round tables, debates and product demonstrations! For a guided tour of major consumer and world distribution trends, head for the World Tour! Accompanied by Nielsen and Euromonitor experts, 28 specialist journalists given an exclusive promotion of their own countries, together with key figures from the sector. To understand all about the international challenges linked to export, take a trip to the World Tour! 9 of the region’s countries present their culture and regional products over a 5 day period in a dedicated demonstration and tasting area. The essential event … the great innovation contest – food, equipment or services – which offers a complete panorama of food innovation. SIAL Innovation offers a preview of all the products that will be trending tomorrow. It’s also an enormous source of inspiration for finding new concepts and, why not, imagining new recipes! The world’s greatest food lab open its doors wide for you! Why come and visit SIAL Paris? An observatory attended by 2 in 3 visitors, including the exclusive TNS-Kantar / XTC study that puts into perspective the expectations of consumers from 9 parts of the world and product offer, as well as offering a forward-looking presentation of future food trends. As in 2014, French companies are highlighted, with shared “Made in France, Made with love “ signing. This year, over 1 000 companies will present their products to the public under this banner. Visitors can also meet the French companies awarded for their “Creative France” innovations on the “Business France” stand.